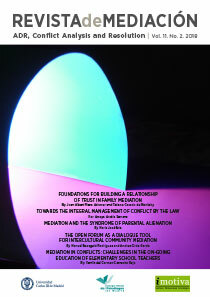 Revista de Mediación (Journal of Mediation) is a free of charge Journal and it is only accessible at revistademediacion.com. Emerging Sources Citation Index, Web of Science’s new edition. The contents of this Index are being evaluated by Thomson Reuters for their incorporation to Science Citation Index Expanded™, Social Sciences Citation Index®, and Arts & Humanities Citation Index®. Latindex (Regional Online Information System for Scientific Journals of Latin-American, the Caribbean, Spain and Portugal). PSICODOC (Base de datos bibliográfica internacional de Psicología). Base de datos ISOC (CSIC). Revista de Mediación holds the printing and reproducing rights of all the papers published under any form or means, although reasonable requests by the author to gain permission to reproduce his/her contribution will be responded. Publication by and on other media is not authorized, unless upon request and in accordance with the responsible entity. 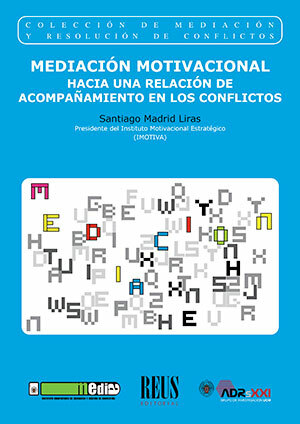 Authors are exclusively responsible for the opinions and assessments expressed in their papers, and these do not compromise the “Revista de Mediation’s” opinion. Revista de Mediación (Journal of Mediation) is not responsible for the opinions expressed by the authors in the articles published.